Yusaku Miyazato has won his long-sought-after first title in his 11-year career as a professional in the season-ending Nippon Series JT Cup. 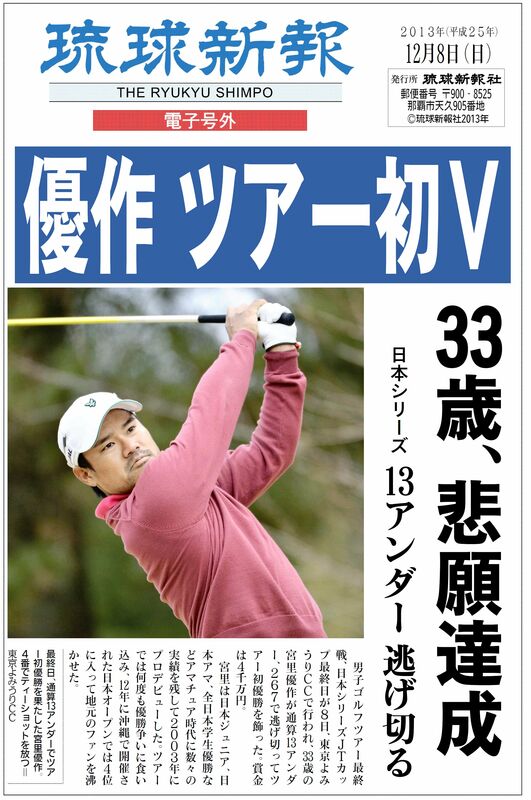 The final round of the JT Cup was held on December 8 at the Tokyo Yomiuri Country Club. The first-round co-leader with other three players including Yoshinori Fujimoto, Miyazato assumed second place in the second round only one stroke behind the leader. In the third round he regained the top position. In the end he won the title in 267 strokes (13 under par), three shots ahead of China’s Ashun Wu. Miyazato received 40 million yen in prize money for the win and moved up to seventh place in this season’s money rankings. Miyazato turned professional in 2002, after winning the Japan Amateur Championship as well as three consecutive Japan Student Golf Championships. Originally from Higashi Village, 33 year-old Miyazato is the older brother of LPGA player Ai Miyazato.